Wild West Custom; Making Motorcycles the ol’ fashion way-one bike at a time! 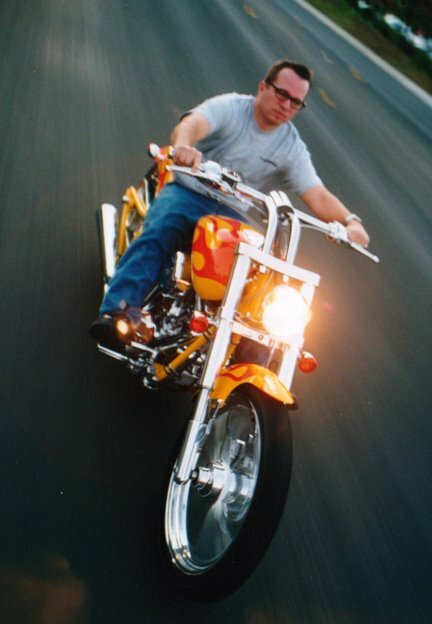 Back when I had all my hair and a gallon of gas was two bits, muscle cars and Brit bikes were our chariots of choice. 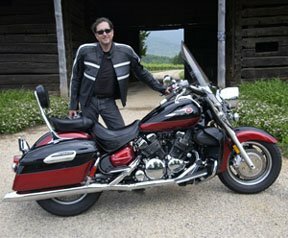 Motorcycles were one step below dependable (except for those nice people you met on a Honda) and though the cars were basically reliable, we worked real hard to make them run as badly as our bikes, then we worked at making the bikes run even worse. All in the name if individuality and the need for speed. We took Brit bikes and Jap bikes (and some of us Harley’s) then tweaked, twisted, welded, raked, and stretched any part we could so that our sleds would look like the Billy Bike and take off like a banshee. Some shade tree techs got what they wanted, we all blew up lots of motors. And thanks to those years of distinct effort by demanding individuals, a new genre of American motorcycle came into its own; the Custom Cruiser. Today you can buy a brand new bike and before you’ve taken delivery have all the hot whiz-bang-do-dads you like added on. Chrome, powder coating, custom paint and then there’s cams, carbs, and stroking. You can even get on a dyno and have a custom computer chip burned specifically for your bike’s setup. Or you can just buy a Wild West custom, and have all you’ve dreamed about, lusted for and drooled over, straight from the crate, that I if you’ve got a spare 35 grand stashed under the mattress. The location of the Wild West Motorcycle Company is anything but wild. They’re tucked away in a non-descript commercial building on a dead-end street in an industrial park in Poway California. Which was a two-hour freeway extravaganza from where I was staying in Venice Beach (and after making the trip I understood why no-one else wanted to go with me). Fleeting freeway flyers on cell phones and my New Yawk pedigree aside, I was well received by the Wild West folks in Poway, right about the time the sun started a dive toward the horizon. Andy Paluczak, Wild West’s Sales and Marketing Manager, gave me the nickel tour then pushed a Vigilante out of the plant’s freight entrance. That was my first and only look at the bike in the daylight, which was fast becoming a scarce commodity. I could have stared and photographed it all day, the reflection of setting sun in exploded over the yellow tank with orange flames. The finish was impeccable, the welds smooth, and not a burnished fastener in the lot. But it was time to ride. I confess; I’m not a cruiser rider. I’m partial to having my head tucked in behind a sport fairing and scouting for the fuzz, so every time I get on a bike that wants me to put my feet out in front of me and drag my bum along the pavement, it takes me a bit to get into the groove. That first time I let the clutch out I was waiting for the bike to tell me off, but it didn’t. I eased the lever out and the throbbing S&S twin and I rumbled out to the road. Hands down, no argument, the Wild West Vigilante is the most solid motorcycle I’ve ever ridden. There isn’t any resonance, at any RPM. No buzz no boom, just seamless power. I’m sure the oil-in-the-frame protocol can be thanked for that. Coupled with the fact that Wild West doesn’t take the S&S engines out of the crate and bolt them to frames. Each motor is balanced and blueprinted, and Wild West’s tolerances are tougher than most, few parts make the grade. Ditto on the wheels, while they’re bought from another manufacturer but tested and only the best accepted. Stay tuned, they’ve recently installed a huge CNC machine and are testing designs for their own wheels. Mounted on the Vigilante’s rear wheel is a 250 tire. Probably the only piece of over-the-counter rubber that could transmit the throbbing 105 horsepower to the pavement, other than a drag slick. I expected poor handling due to the rake and resplendent rump of a tire but was proven wrong. Again the proof is in the engineering, the Vigilante is perfectly balanced, take your hands off the bars (which took a ton of testosterone to try, the bike does cost 35 grand!) and the sucker tracks straight as a laser. Wild West credits the Baker RSD (Right Side Drive) transmission for that. By switching the drive pulley to the right they’ve eliminated the need to offset the drive train. The result, perfect balance, and rolling along a mere 21 inches above the pavement balance become a noticeable issue. It doesn’t surprise me that a small company of a dozen or so people with sales of about a hundred bikes a year would set a benchmark for quality construction and design. Distinctly American in concept and execution, the Vigilante lives up to its name, it takes no prisoners. Wheels: Performance Machine forged aluminum, polished. Choice of Wrath, Trinity, Villain, Vintage, and Trespasser.